Sometimes we do things differently here in Coolatai. Remember Al from A Dinner Invitation who pestered Brian until he arranged a consignment of fresh abalone to Rocky Springs? Well not long after that Al had another idea. That idea led to a paddock of oats on Al and Lis’ property. Standing proudly, ready for the harvest, was a week-old John Deere S670 header with a 35 foot draper front. 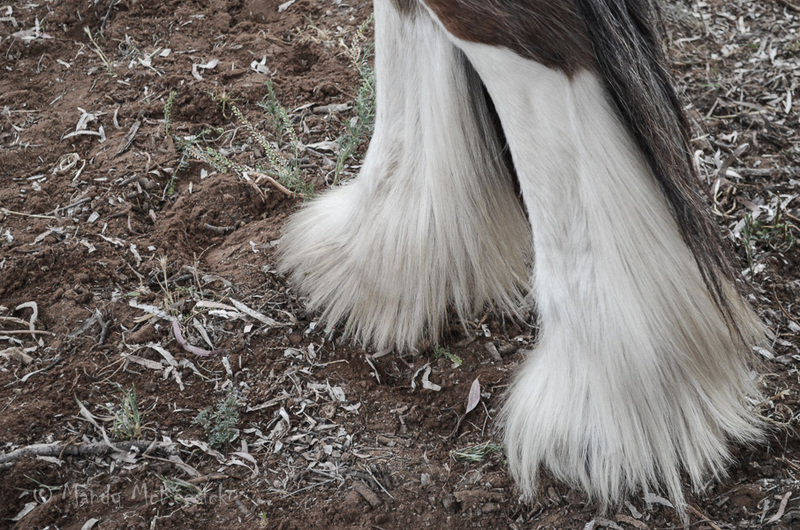 Standing next to the shiny header was a bloke called Peter, three Clydesdales and an 1860s stripper and winnower. Peter had bought the stripper and winnower for $350 thirty years ago. Needless to say the header cost considerably more than $350. Into the paddock went the two marvels of generational machinery; the horses unfazed by the rumble around them, nor the shutter clicks of the crowd who had gathered to watch the spectacle. 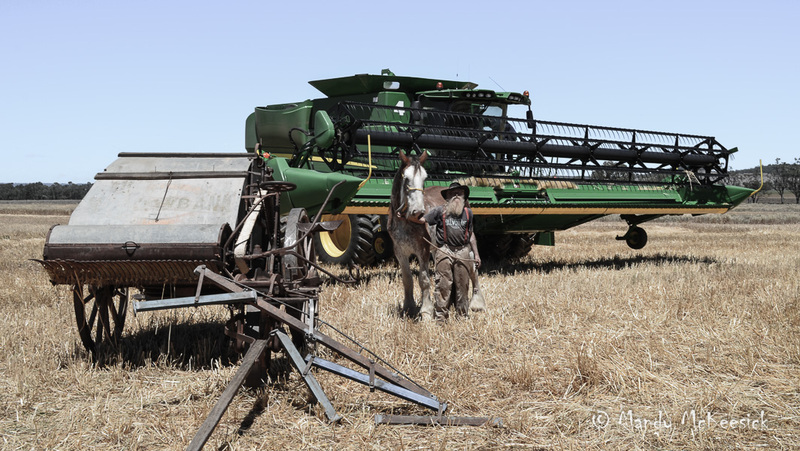 While the header chewed diesel, horsepower pulled the stripper. Two older more experienced horses, Punch and Amy, flanked the younger and stronger Jack who worked the centre. Six year old Nellie watched quietly from a shady tree and her position as “spare tyre”. The header was followed by a chaser bin, which collected the grain on the run allowing the giant machine to continue working. In the 1860s the horses had to pull the stripper to the stationary winnower. 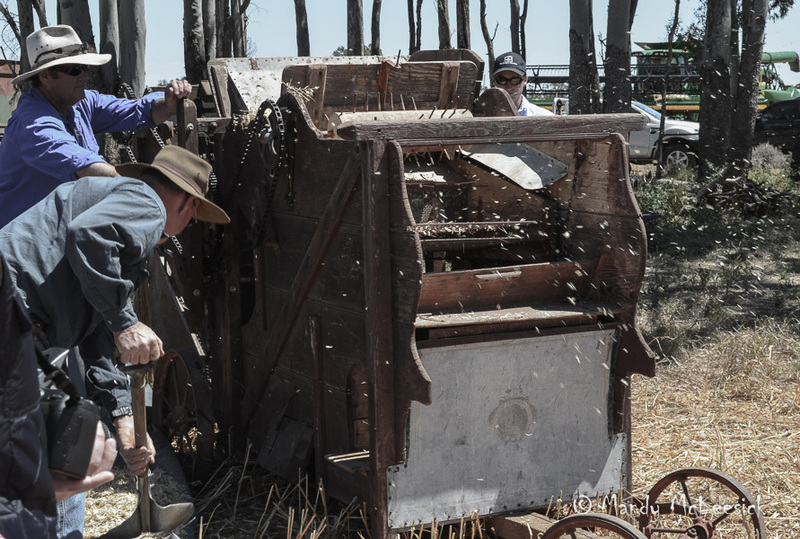 On this occasion Al shoveled the grain from stripper to winnower while Brian turned the handle on the winnower to separate the chaff from the seed. It was definitely a labour intensive age and possibly contributed to the low uptake of gym memberships in those days. In the early 1900s the stripper and winnower were joined to produce the first combine harvester, and the technology progressed through to the sparkling header in work today. Although the 1860s method was slow and required much in the way of human effort, even modern headers break down but thankfully a top-of-the-line header being lapped by a couple of nags was not witnessed this day. 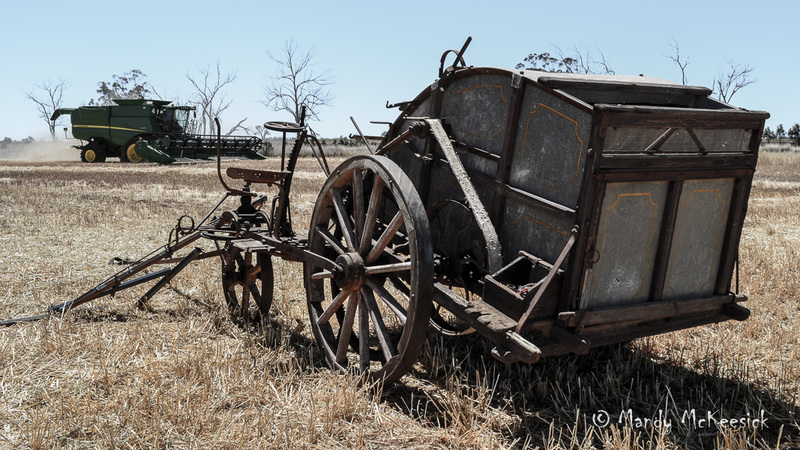 After a couple of laps the horses were retired to the shade and loving pats from onlookers and the 1860s stripper sat lonely in the paddock as modern technology completed the job. We owe much to our feather-footed friends. This entry was posted in They're a Weird Mob and tagged Clyde Engineering winnower, clydesdales, john deere header, Meadowbank stripper, stripper and winnower. Bookmark the permalink. Wonderful! You guys have the most creative ways to make your own fun. Don’t they say necessity is the mother of invention! That is a nice side by side view of old and new technology! I grew up down the street from one old dairy farmer who was in his 80s at the time. He had a team of draft horses, as well as mechanized equipment, and used both. In later years, one of his sons took over the team using them for pulling competitions. Yes. we owe much to our feather-footed friends.